Conversion centric campaigns are those that focus on satisfying the queries and demands of consumers in the most prompt, efficient and effective method possible. This can be reflected in the website content only if you build a reputation that garners trust. Show them what your company has performed earlier instead of telling them about what you might do in future. Let your brand advertise itself. 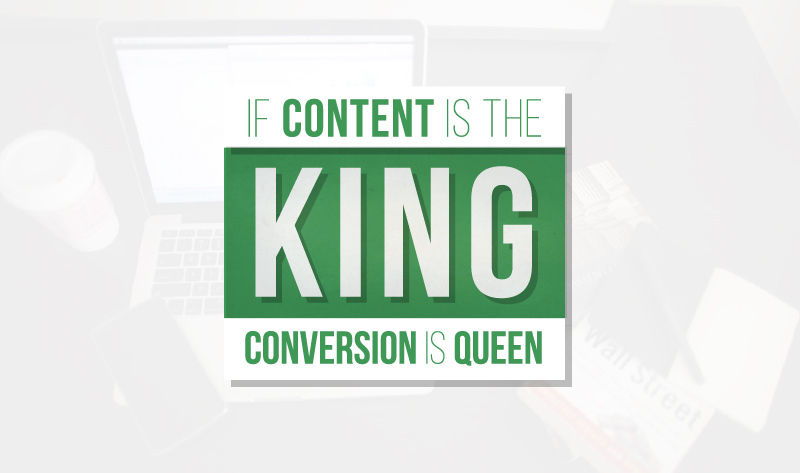 Conversion, albeit the more important aspect from a business point of view, can only be achieved through content. One cannot happen without the other. Consumer centric data can be achieved by channeling resources towards going back-to-basics that is, focusing on where the consumer is facing issues or highlighting a utility of your product or service that they did not even know existed. Intersperse business/product details with interesting facts. Think of ways to retain customers instead of just getting a one-time high traffic. For those who do not have the budget to invest in a dedicated Conversion Optimization team, you can use Google Analytics for free to run a few tests and then identify the problem pages/issues through this free service and work on them. A single investment in a paid application like Hot Jar also helps in optimizing on the conversion rates by utilizing the quantitative insights it provides from Google Analytics. Don’t use tests to cushion your ideas. Often, optimizers only focus on the positives and thus, live in a pseudo-comfortable atmosphere which is not actually reflective of conversion. Have a deliberate Stop time allotted to your tests (with test duration tools) to avoid getting false positives. After a point, focus only on testing certain aspects to save on time and effort. Testing everything is not necessary- just concentrate on things you think might be broken and need fixing. The virtual world is making great strides and something that reaches the internet, is always on it. Create content that you know will last a lifetime. You website should not only cover what’s fresh and a-buzz, but also be substantial enough to stand the test of time. It should be worthy of a read (and be somewhat relevant) even five or ten years down the line. It should infuse nostalgia among readers, and leave them wishing for more. In the short and long run, it is content that becomes the soul of your website. Social media is a double edged sword which if used properly will gather for you an insurmountable amount of online traffic and will have a definite impact on conversions. Content becomes the object of attraction in all websites, but the vehicle to carry the content needs to be as powerful as the content itself. If it doesn’t reach the intended audience, then what is the use of having a content that sells a business that could be the best in world? This last point is easily achieved if the first five are followed diligently. Once you have a consumer base that is loyal, the next most logical step is to make them feel welcome and respected. Engage in communication with them and bring down the glass barrier of screens that separates you from your customers. Give importance to feed-back, respond to appreciation as well as criticism. Create a two-way media of conversation and you will hold the fort on your conversions and continue to add more in the process. Sunny Popali is an everyday learner and editor, working at Good Monster a search engine optimization agency. He is passionate about helping online businesses to achieve their goals with cost-effective SEO and Digital Marketing services. He believes that you should keep conversion rates in mind.